Place potatoes in stockpot, add water to cover, cook until tender. Drain water , return potatoes to stockpot. 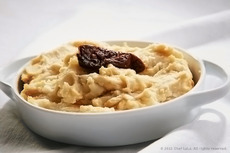 Cut the potatoes in four, transfer to a bowl and slightly mash with spoon (big chunks). Add buttermilk, chipotle sauce, salt and pepper. Fold Ingredients together to combine. Cook until completely heated through. Return to pan and heat covered when ready to serve, or place in the oven, covered, at 250° for 15 minutes. When you mix your potatoes mix them as little as possible because the more you mix them the stickier they will become. Chipotle peppers in adobo sauce can be found in the Hispanic section or the canned chile pepper section of the grocery store. For chaffing dish service - for moister potatoes, add more buttermilk or chicken stock. Colocar las papas en una olla, llenar con agua y cocinar hasta ablandar. Vaciar la olla y cortar las papas en cuatro trozos, luego colocarlas en un tazón y aplastar con una cuchara (trozos grandes). Agregar el suero de leche, la salsa chipotle, la sal y la pimienta y mezclar los ingredientes. Calentar hasta cocinar por completo. Mezclar las papas lo menos posible para evitar que se tornen pegajosas. Los pimientos chipotle en salsa de adobo se encuentran en la sección Hispana o de pimientos en lata en tiendas de comestibles.